Work on the BVI Cruise Pier Expansion Project is currently underway, and was marked on Sept.1 by the Minister for Communications and Works Honourable Mark Vanterpool and Managing Director of the BVI Ports Authority Claude O. Skelton Cline, hosting a tour. Government officials highlighted both the marine and landside work currently happening at the Cruise Pier, according to the port authority. On the marine side, IDL Projects and Meridian Construction Joint Venture Company is responsible for the strengthening, lengthening and widening of the current pier. Vanterpool said in a statement that piling for the marine works may begin as early as this week. The company will also dredge in and around the pier facility and turning basin to allow safer maneuvering of ships; remove an existing rock face that currently protects the land and replace it with a bulkhead for better protection of the landside; and establish a 20-foot boardwalk along the southern waterfront which will eventually handle pedestrian traffic. 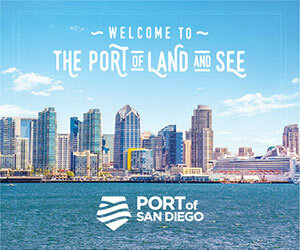 The scope of work for the expansion involves the lengthening and widening of the cruise pier to more than 1,300 feet and 60 feet, respectively. The pier is also being strengthened to accommodate ships up to 170,000 tons. Along with the pier work, the project also includes a landside development, called Tortola Pier Park, which will feature commercial, retail, entertainment and green spaces, open to the public. 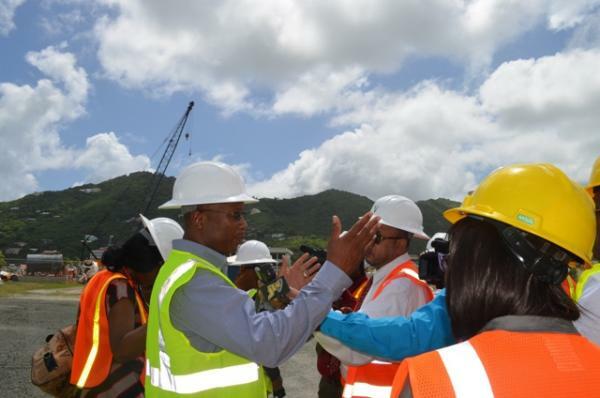 Photos: Managing Director of the BVI Ports Authority Claude O. Skelton Cline during a tour of the new pier. 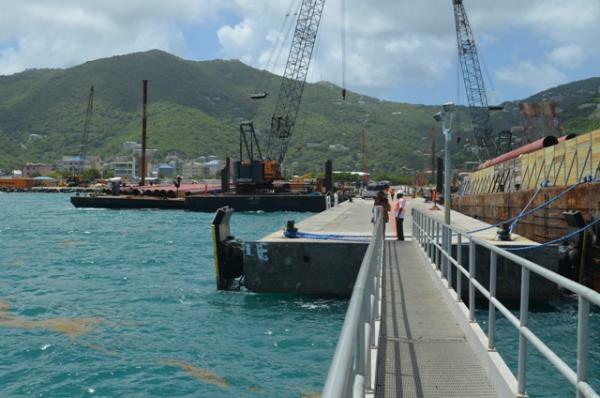 Work underway on the BVI pier expansion.